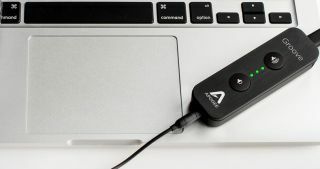 Apogee Groove: New portable USB DAC/headphone amp unveiled | What Hi-Fi? Apogee Electronics has announced the introduction of Groove – its new portable USB digital-to-analogue converter and headphone amplifier that's been designed for use with Macs and PCs. The company has drawn on 30 years' experience working in digital audio technology to produce the Groove, which aims to offer "a music listening experience of unparalleled quality". Groove houses a Constant Current Drive output that can handle the "wide impedance variations" of modern headphones, with the output stage's voltage dynamically "molded" to these variations. Meanwhile, a Quad Sum DAC design uses four digital-to-analogue converters per channel in order to "achieve the highest dynamic range and lowest distortion" compared to rival products. Groove supports high-resolution audio files up to 24-bit/192kHz and has a USB 2.0 connection to your computer, with the device packing a maximum output level of 225mW into 30 ohms. In terms of its exterior, the Groove is built from aluminium and measures 95 x 30 x 16mm. It is due to go on sale this spring, although pricing for the device has yet to be confirmed by Apogee.